Regional maxima are flat zones surounded by pixels of lower value. If the input image is constant, the entire image can be considered as a maxima or not. The desired behavior can be selected with the SetFlatIsMaxima() method. Definition at line 49 of file itkRegionalMaximaImageFilter.h. Definition at line 59 of file itkRegionalMaximaImageFilter.h. Definition at line 65 of file itkRegionalMaximaImageFilter.h. Definition at line 67 of file itkRegionalMaximaImageFilter.h. Definition at line 64 of file itkRegionalMaximaImageFilter.h. Definition at line 66 of file itkRegionalMaximaImageFilter.h. Definition at line 62 of file itkRegionalMaximaImageFilter.h. Definition at line 69 of file itkRegionalMaximaImageFilter.h. Definition at line 71 of file itkRegionalMaximaImageFilter.h. 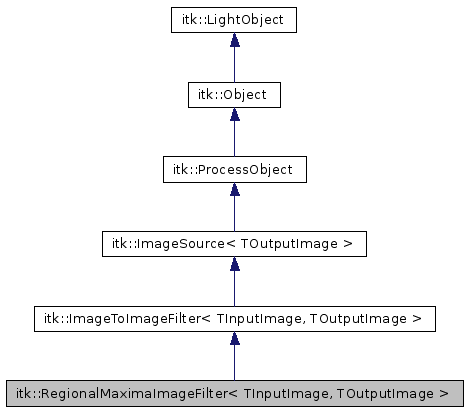 Definition at line 68 of file itkRegionalMaximaImageFilter.h. Definition at line 70 of file itkRegionalMaximaImageFilter.h. Definition at line 63 of file itkRegionalMaximaImageFilter.h. Definition at line 58 of file itkRegionalMaximaImageFilter.h. Definition at line 54 of file itkRegionalMaximaImageFilter.h. Definition at line 56 of file itkRegionalMaximaImageFilter.h. Definition at line 135 of file itkRegionalMaximaImageFilter.h. RegionalMaximaImageFilter will produce the entire output. Single-threaded version of GenerateData. This filter delegates to GrayscaleGeodesicErodeImageFilter. RegionalMaximaImageFilter needs the entire input be available. Thus, it needs to provide an implementation of GenerateInputRequestedRegion(). Set/Get wether a flat image must be considered as a maxima or not. Defaults to true. Set/Get the value in the output image to consider as "foreground". Defaults to maximum value of PixelType.